I am so happy for the fall/winter season purely to eat soups and chili. I can’t think of anything more comforting than curling up on the couch, with a soft, oversized blanket, a big mug of hot and steamy soup or chili and reading an intriguing book or watching a nail biting TV show (any other Revenge fans out there?!?). I have already made several soups this season and just made my first batch of chili, and even though I try and slurp these up as much as possible in the cooler months, I will always love my salads. Just like soups and chili are comforting, to me salads are comforting in their own way. It is like my body craves them when it needs a boost of nutrients and after consuming them, I feel so good. The problem is the fall and winters are certainly not your ‘typical’ salad seasons. Sure I have a few fall salads that I enjoy regularly, but it is still a struggle to enjoy a good fresh, fall salad with seasonal fruits and veggies. 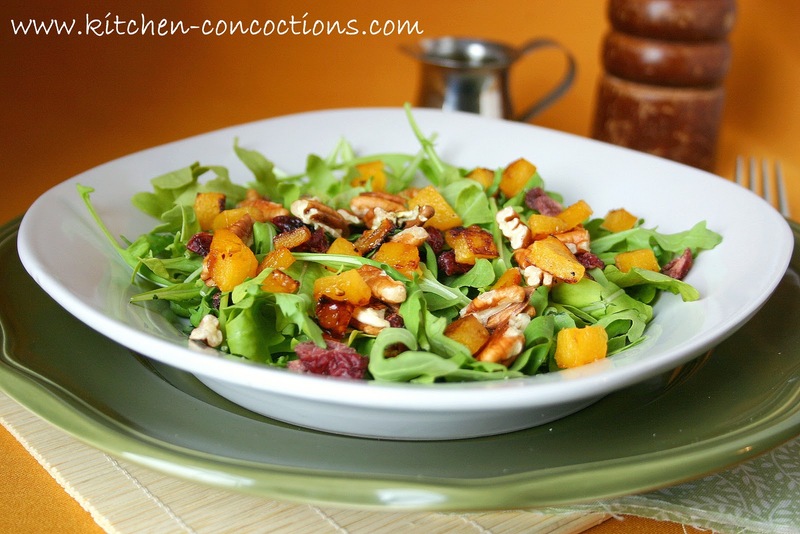 That is why I was totally drooling all over my chin when I saw this Roasted Butternut Squash Salad with Warm Cider Vinaigrette! So many fresh fall flavors! 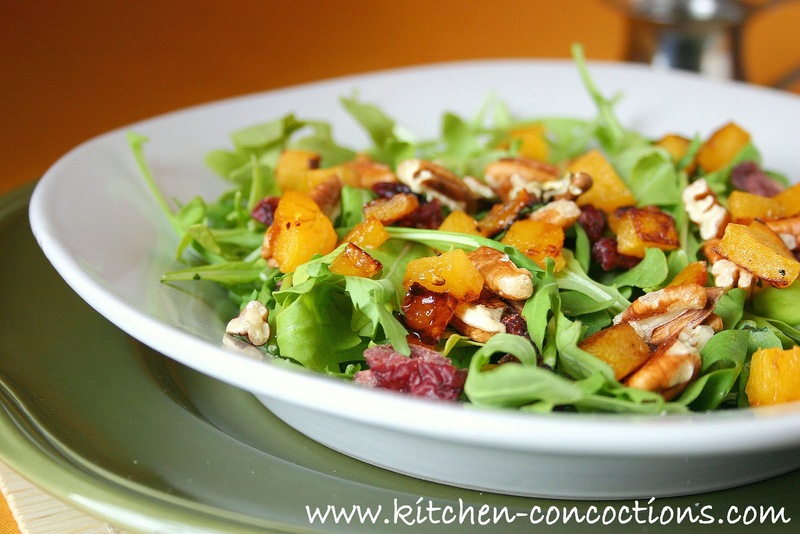 From plump dried cranberries to wholesome butternut squash to smooth cider vinaigrette, all served a top spicy arugula. This salad has saved my salad loving soul and will totally carry me through until next summer when I will be scarfing down this one, this one, and this one! Place the butternut squash in a bowl. Add 1-2 tablespoons olive oil, the maple syrup, and 1/4 teaspoon each salt and black pepper and toss to combine. Place squash on baking sheet and roast for 15 to 20 minutes, stirring occasionally, until tender. While the squash is roasting, heat 2 teaspoons oil in a small saucepan over medium heat. Add shallots and cook 1 minute. Add apple juice and vinegar; bring to a boil over medium-high heat. Cook for 6 to 8 minutes, until the cider is reduced to about 1/4 cup. Remove from heat and whisk in the mustard, remaining olive oil, 1/4 teaspoon each salt and black pepper. 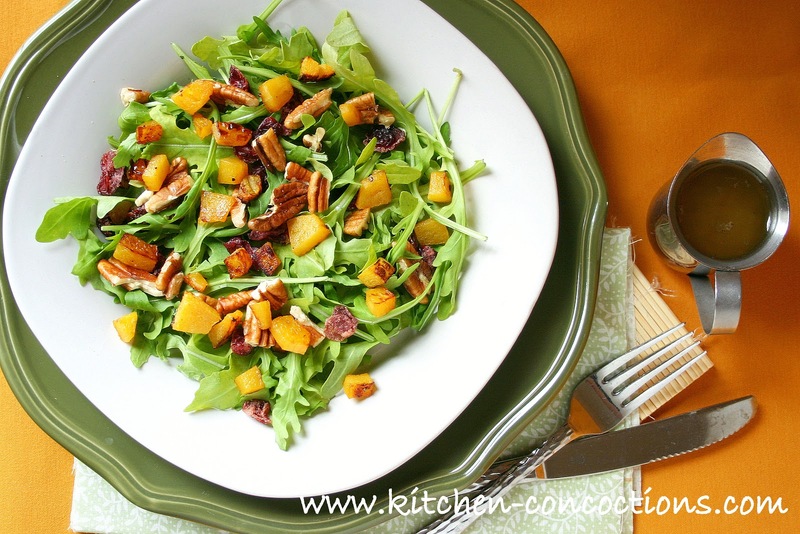 Place the arugula in a large salad bowl and add the roasted squash, cranberries, and pecans. Spoon just enough vinaigrette over the salad to moisten and toss well. Serve immediately. I liked Revenge!! Guilty pleasure!! I hope you're caught up…if not…spoiler alert! It was awesome with Amanda (fake Amanda) fell off the balcony. I hope she wakes up from her coma and looses her memory & only knows being Emily & forgets she's pretending to be Amanda. That's my prediction/hope!